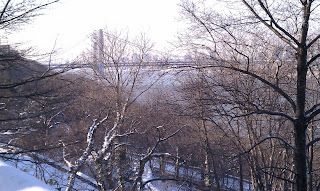 A really fun and snowy run through the hills of Riverdale with the Inwood Hill Runners. We rock. 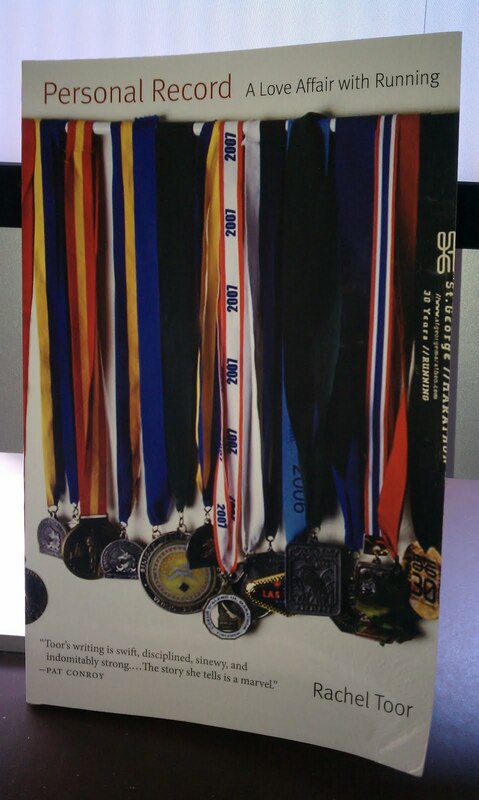 When I first read the article in Running Times called "Resonant Routes" in the Oct 2010 issue, I was swept away. It was like a movie scene where someone remembers various scenes from the past in succession: I flew back to my old neighborhood where I ran in high school to stay fit for soccer, to the hilly and cold 10K loop in Durham, NH where I ran for Crew practice in college, the routes along the River Shannon when I studied abroad in Ireland, then to the longer loops I discovered when finally running for the sake of running and training for my first half marathon. It took me to the loops around my Mom's house in NJ, my in-laws house in Victoria, BC, the various routes I've run on vacation around the globe.Then came memories of the friends I'd run many of them with from everyday bagel runs in New York to the time we got lost in Dingle, Ireland and ended up in a herd of self-directed cows with diarrhea. Then I thought just about the runs I'm fortunate enough to have access to every week here in Northern Manhattan. My favorite hills and loops of my immediate neighborhood, those routes where you tend to know the exact distances, no matter how you piece them together. I remember details of routes, small corners I like to hop over, ramps in the sidewalk made by giant tree roots that I soar over like a child on a bike, things like that. I like to run on one side of the street vs another because there's an apartment with a library I like to peek at or because I know the wind is less strong on that side. Whatever it might be, Rachel's words brought it rushing in. Wow did I like that article. A few more times over the next couple of months I read more articles by Rachel Toor that made me laugh, remember something about my own running or simply made me smile. I hardly read bylines unless I really enjoy something, so I started to notice a trend. I think I even tweeted something like "Everything I've read recently that I really liked has been written by Rachel Toor." Now, maybe I'm beginning to sound like a stalker, but if you've read her stuff then you know what I'm talking about. Her work resonates with me as a woman and as a runner. After my friend Scott reviewed her latest book a while back (here), I knew I needed to get my hands on it. I loved the book! Shocking, I know. After reading the articles by Rachel, I knew she was an author who speaks frankly, points out things that everyone has on their minds anyway, and does so with humor and fun. The book consists of 26.2 "chapters" that go from her days as a non-runner right through to her current ultra-running badassery. One of my favorite chapters, "The Closet" made me laugh as she describes the runner's habit of hoarding clothes, shoes, safety pins, etc. I even showed my husband and made him read a few paragraphs. He shook his head in recognition, especially the part about the ridiculous number of socks kept in an overstuffed drawer. Chapter 3, "The Routes" brought my mind back to "Resonating Routes", the reason this whole girl-crush even started. It reminded me of the routes I run weekly with my Inwood Hill group, the nicknames we have for the different hills, flat stretches and the way we can describe places by mentioning something as simple as an odd feature of the sidewalk there. I started reading Chapter 14, "Becoming a Marathoner" on the train to work one morning heading to Midtown, but I had to stop and put it away for a more private time. RT talks about running the 2001 NYC marathon right after 9/11. I can't read or watch anything about 9/11 without crying so I put the book down until I got home where I could dab freely at my eyes as I read. 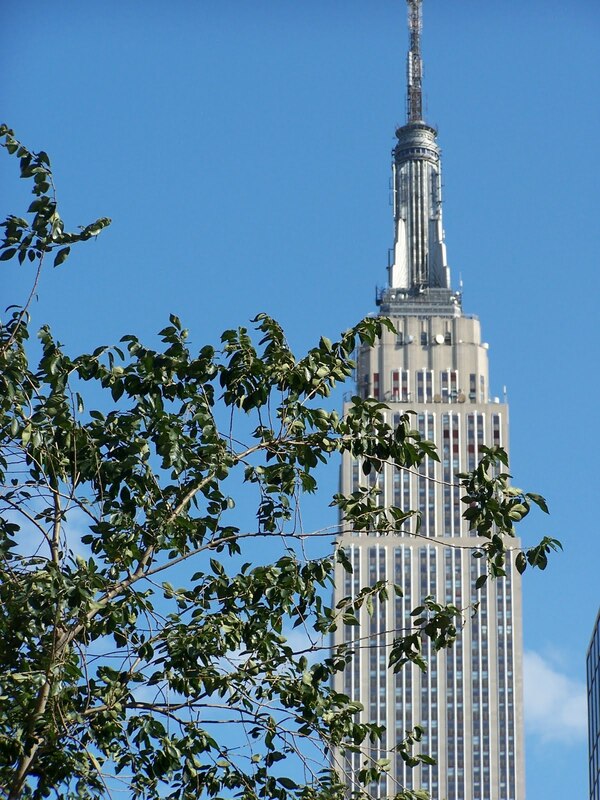 She managed to capture the heart of New York in those few pages, well done. The rest of the chapters are fun, interesting, and just great reads for us runners. It's an easy, quick read and the chapters are short and perfect for squeezing into your day or sitting down and devouring in an evening. Rachel reminds me of my very best friend and running buddy, Nancy who has the same love for the trails and long, scenic races. She'll love this book too. The text came later than I expected on Wednesday morning, but it finally popped into my inbox, bringing its joyful little message "NYL PRESCHOOLS ARE. CLOSED TODAY." I had a little 5:30am celebration and went back to sleep for a while. When I couldn't stand the excitement any longer, I flew to the front windows to see the snow. It was beautiful, the world was white and the sun was coming up. It was a perfect day: public school was OPEN, my work was closed (many of our kids are medically fragile) and 9 inches of powder lay like a blanket, waiting to be explored. 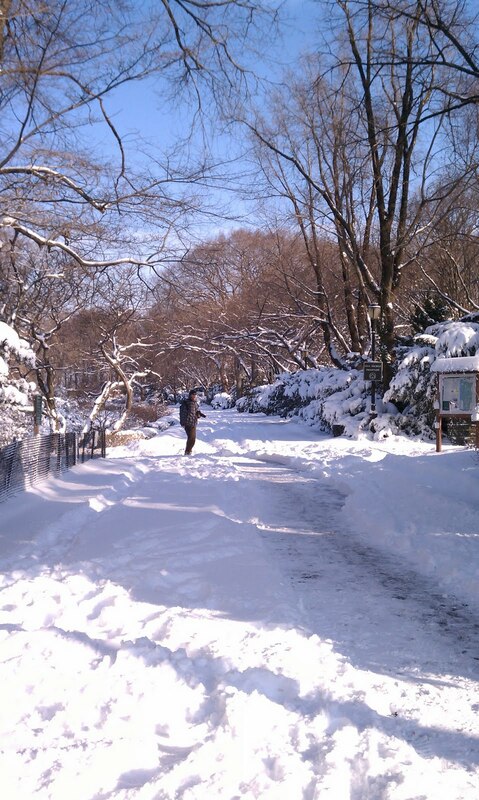 I pulled on my new Yaktrax, put a load of laundry in the wash only 187th st and took off towards the park. 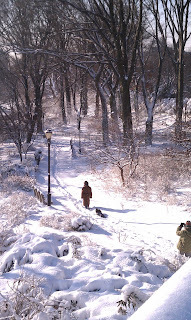 Fort Tryon park was breathtaking, all of the trees heavy with snow and the sun streaming in. 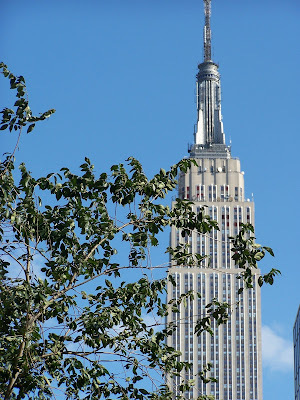 I trotted up to the highest part of the park by the flagpole and frolicked around, buzzing around looking at the view from all sides. The snow was shin deep in many places, but the yaktrax did their job well. I looped around the Cloisters, by the river (windy!) and frolicked as much as possible. I was fluttering all over, arms circling to help me move through the deeper snow. I probably looked like a southerner seeing snow for the first time, just dressed like a ninja. I remembered my sunglasses and was glad as the yellow rays bounced off of the snow into my face. Running during daylight is such a treat at this time of year. Sadly my run came to an end as I checked my watch and saw that the laundry would be done soon, so I ran back down the snowy street since the sidewalks were already cleared by this point. I spent the rest of my snowday exactly the way I planned it: I took out my snowshoes and tackled the hills and untouched paths of Fort Tryon park on my way to and from the big sledding hill. I spent a few hours sledding which is a really good hill workout in the end. 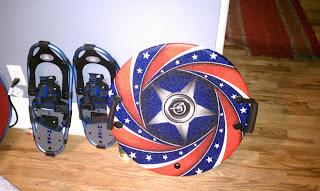 I flew down on my snowdisc sled and charged back up to the top about 100x before my feet started to get cold and my tummy began to rumble. 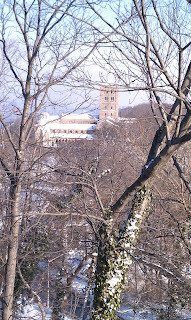 I shared the hill with a few other families and their children, but since public schools were open, it was fairly quiet. What a perfect day. I'm feeling the effects of all of my efforts today though.... Whew am I sore in all sorts of new places. I remember one missed landing off of the snow ramp we built where I landed on my right asscheek, how could I forget when it hurts each time I sit down? I'm a creature of habit, I run on Tuesday, Thursday and Saturday and swim Monday, Wednesday and Friday. Sunday can be a toss up, a gym day or a rest day. Instead of running yesterday morning though, I got in the car and headed down to visit my grandmother in NJ because she's recovering from emergency brain surgery that she had the day after Christmas. I told myself I'd just do my run Sun morning, but when I came back last night after a draining day, I knew it would be slippery and icy and I'm not looking for an injury. I had plans with friends for brunch and a movie today, so I pushed the run to the afternoon. That's always a risky move, I lose motivation after like 2pm. I managed to rally because I was getting cranky without any outside time this weekend, so I hit the roads. I had no route or plan in mind, just run til it got dark and end at the car so I could move it to a garage for the winter months. I took off and hit the Greenway with the sun beginning to set behind old George. I thought about my Nan who told us that she walked 25 feet or so in therapy this week despite not having any desire to do so, but she said she bucked up and just did it. I looked at the road ahead of me and thought about how hard it must be for her to see a point to all of this. She keeps saying that she'd rather just die than have to go through rehab. Whew, that's hard to hear, but I understand what she's saying, the bumpy road ahead looks insurmountable and she doesn't know if she has the strength for it. Who are we to argue? 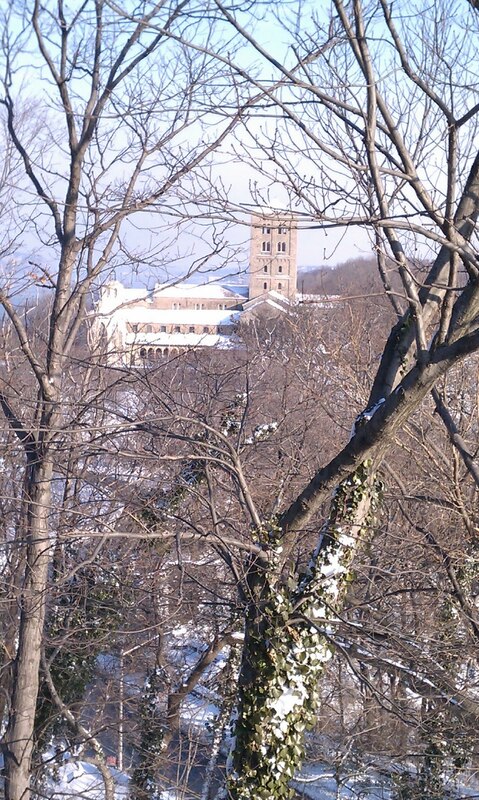 I let out some tears and sadness along the way and felt better as I tackled the hills in Inwood and turned towards home. I took the hilliest route I could find and felt awesome. I flew up hills that slow me down on occasion as if they weren't even there. The stress melted away and I bounced home feeling lighter and so grateful that I'm healthy and can put one foot in front of the other every day. This is one of my best, most useful Christmas gifts and I'm so excited to start using it today!!! 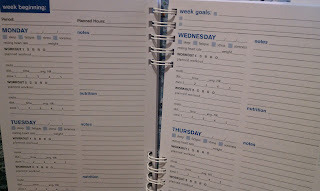 In the past it has been difficult to keep track of my running AND my swimming/biking all in one place because I couldn't get in the habit of posting to Daily Mile and my paper journal only had room for my runs so I'd have to squeeze in other workouts in the margins. It wasn't pretty. 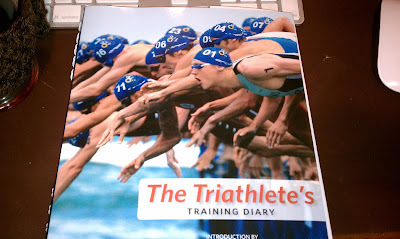 I'm really excited for this journal because it is perfect for 2011: Year of the Triathlon. 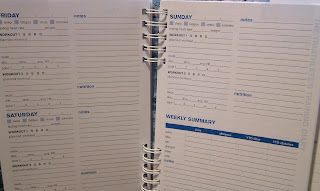 Check out the fun features! 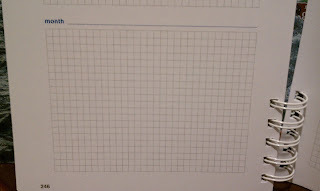 Each week is two full spreads with a tally at the end for EACH discipline. Yay! 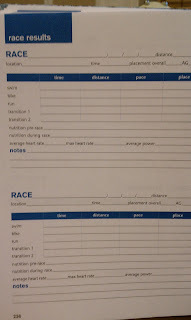 There are training grids for every month to keep track of things like hours training, distances, heart rate, whatever you like to keep track of to help your training. A race results page that can actually fit ALL of the info from race day! 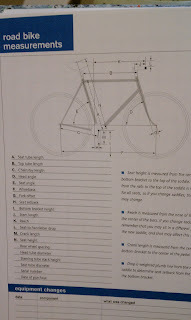 Handy tips for a bike newb like myself.